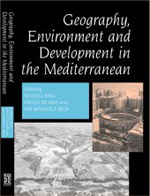 Explores the many geographies of the Mediterranean Basin with chapters on the Mediterranean environment, geopolitics, economic development, trade, demography, migration, cities, tourism, landscapes, mountains and islands. Written by an international team of geographers, the book offers a carefully integrated and up-to-date treatment of the contemporary human geography of one of the world’s most fascinating and significant regions. 10 Northern Europeans and the Mediterranean: a New California or a New Florida? Strongly recommended… Up-to-date, comprehensive and affordable. A thought-provoking book that emphasizes the economic dynamism and environmental fragility of the Mediterranean region. Will be of interest to researchers and students alike.